Through our commitment and experience, Starr Homes establishes business relationships with our clients that last a lifetime! Whether you find one of our plans that fits your needs exactly, or you are seeking a completely unique home concept, Starr Homes is equipped to bring together the best design elements and materials to make your dream home a reality. Building a custom home is easier than you think. Have some thoughts collected, a few pictures in an ideabook, and meet with our design staff to start creating your custom home. Starr Homes has developed a reputation for integrity, superior planning, quality construction/materials, and saving our clients' money. Starr Homes President Gerry Starr is deeply involved in the design process from the moment you walk in the door with your dream home idea. Gerry has two engineering degrees from the University of Missouri. His passion is the floor plan design, functionality, and overall aesthetic of the way your home will live for you and your family. During the custom design process, he will bring his guidance, expertise, and creativeness to the project. Bob grew up near San Francisco and entered the home building industry in 1998 traveling around the country as a consultant for builders on small and large scales. His goal for Starr Homes is to refine our communication with you during the design process of your dream home. He enjoys seeing a home go from a concept on a piece of paper to reality when walking through your custom built home with you. When Bob isn't working, he enjoys spending time with his family and being outdoors. Richard started working at a very young age and has over 40 years of experience as a project manager working with various builders in the Johnson County area. Richard enjoys checking on each individual building project throughout the different construction stages. He also enjoys working with the project managers to help you build your dream home. He is very organized and strives to create the best experience during the construction of your home. Tracy was raised in Overland Park and obtained his Construction Science Degree from Kansas State University in 1979. He has over 22 years of experience in residential construction and over 13 years of commercial construction experience. Tracy enjoys assisting you from the floor plan design through the selection of the door hardware. When Tracy is not working, he enjoys playing tennis and golf, and spending time his grandchildren. David has over 25 years of experience in the construction industry and appreciates being able to do what he loves. His passion is home building and enjoys seeing your dreams come true upon the completion of your new custom built home. David is very organized and willing to answer any questions you may have throughout the construction process. When David isn't working, he enjoys spending time with family and watching his children play sports. Ryan grew up in Lake Lotawana, MO and received his Bachelors Degree in Construction Management from the University of Central Missouri in 2009. He has over 10 years of experience in the construction industry and views construction as both a career and hobby. Ryan believes building a solid relationship with you is part of constructing a successful home. In his spare time, Ryan enjoys spending time with family, eating good food, and the occasional golf game. Harry grew up in western Kansas on a farm. He then attended Fort Hays State where he graduated with a Bachelors in Mathematics and a minor in Data Processing. Harry owned and managed Roth Construction Company for the past 33 years and has built some of KC's most distinctive and luxurious residences. He has built a reputation of integrity and commitment to each project and is bringing those characteristics to Starr Homes as a project manager. When Harry's not working, he enjoys spending time with his family and attending a Royal's game when he can. Steve grew up in Independence, MO and has 11 years of manufacturing experience; as well as several years of management and property management experience. He enjoys being able to communicate with our clients and helping make their dream homes a reality. In his spare time Steve enjoys traveling, working on his car, and riding horses with his wife. Ryan was born and raised in the Kansas City area and graduated from the University of Kansas in 2005. He has over 15 years of experience working in the residential and commercial construction fields. He enjoys helping guiding you through the beginning planning process of building a beautiful home all the way to handing over the keys on move in day. When not working, he enjoys watching the Jayhawks, Royals and Chiefs while grilling and smoking delectable meats. Tony grew up in West Central Iowa and started working for his father's construction company at an early age. 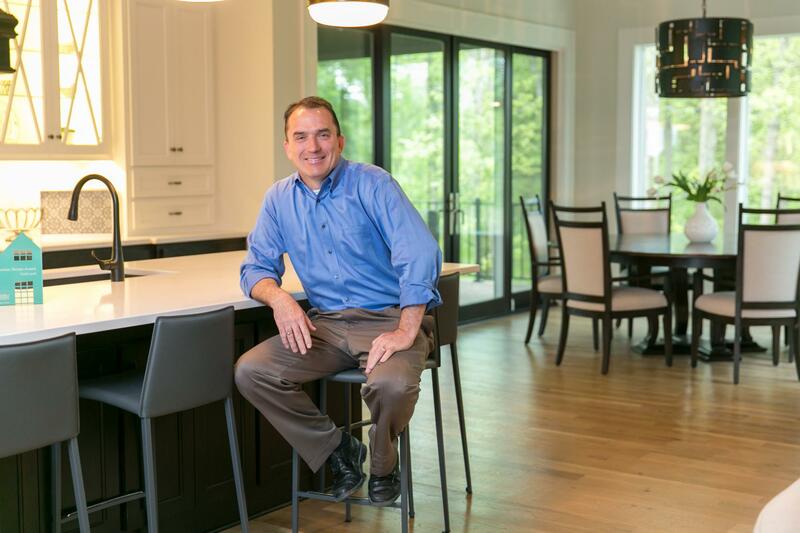 His attention to detail led him to a 20-year career as a trim carpenter for high-end custom home builders in Omaha, and for the past 11 years, in the south Kansas City area. In his free time, he enjoys spending time with family and friends. He can always be found in the outdoors either fishing, camping or hunting. He is also an active member of outdoor conservation groups including Ducks Unlimited, Safari Club International and The Pope and Young Club. Curt was raised on a dairy farm in Wisconsin and in 1981 he graduated from Northeast Wisconsin Technical Institute in a program focused on home building and cabinet making. After moving to Georgia the next year, he spent 30 years as the owner and operator of a commercial cabinet company in Georgia. Curt and his family moved to Kansas in 2015. Curt also brings a unique perspective to our company, as Starr Homes built his own home in 2016! Kirk is an Eagle Scout who graduated from the University of Missouri - Kansas City. For 20+ years, he has developed land for subdivisions, built many quality residential custom homes and holds an ICC National Building Certificate. Kirk is task driven and will bring experience, calmness and laughter to any jobsite. In his free time, Kirk advocates for blood & organ donation having donated a kidney himself & enjoys entertaining terminally ill children with his mascot group, mascots4kids.org. He has traveled to 45 countries and used to be a bat boy for the KC Royals. Andy was born and raised in Kansas City, Missouri and has over 25 years of commercial and residential construction experience. Andy is very organized and believes the Starr Homes Team is the best team in the industry. When Andy is not working, he is enjoying family and sporting events with his wife and 5 kids. Angela grew up in Olathe, KS and received her Bachelors of Fine Arts in Interior Design from the University of Kansas in 2009. She has since paved her way in the new home building industry and enjoys working with new homeowners throughout all stages of construction, particularly during the design and selection process. Her love in helping homeowners discover ways to customize their home by introducing new and unique finishes and design elements has added to the experience in Starr Homes building process. Along with overseeing the selections, she also assists the project managers by pricing custom options and creating change orders for homeowners. In Angela's spare time she enjoys spending time with her friends and family, cooking, decorating, and traveling. Victoria is a lifelong resident of the Kansas City area and has been in the construction industry for 20 years. As the Purchasing Manager, she is responsible for acquiring and assigning bids for projects as well as creating and maintaining purchase orders. Victoria enjoys spending time with family, volleyball, reading and watching her kids participate in competitive sports. James grew up in Texas where he obtained his Civil Engineering degree from the University of Texas and an MBA in Finance from UMKC. He has several years of management experience in the manufacturing, telecommunications, and technology industries. James provides leadership in project estimating, companywide planning/forecasting and financial management. During his time off from work, he enjoys spending time with his family and watching his children's live performances in sports and theater. Angie has 13+ years of experience working in the new home construction industry. Angie directly assists the Director of Construction, Richard Teel, who oversees all of the building projects. Angie is responsible for pulling all of the permits and works closely with the Project Managers throughout the building process. Angie enjoys traveling, shooting pool, and spending time with her family. Susan has over 30 years of experience in accounting and purchasing. In the early 1980's, she worked for a bearing and industrial component distributor in Houston, Texas. From 1988 to 2011, she was solely responsible for all of the accounting for several small businesses on beautiful Sanibel Island, Florida. Susan grew up in Prairie Village and returned to the area in 2012. There's no place like home! Susan handles the operating expenses and non-draw related bills for Starr Homes. Heidi grew up in Olathe, KS surrounded by the family's home design business where she began her accounting career at an early age. Heidi is a busy mother of 3. She enjoys spending time with her family and traveling. Heidi is responsible for submitting draws to the banks as well as many other accounting duties. Jordan was born and raised in the Kansas City area. He graduated from Southwest Baptist University with degrees in Management and Marketing. After several years in the medical billing industry, Jordan transitioned to the Starr team to work with his lifelong love of construction. When not working, he enjoys running obstacle course races and spending time with family and friends. Josh grew up near Lawrence, KS. He has had a passion for building since childhood and an eye for detail that helps maintain a high quality of building and performance. With a background in both commercial and residential construction, he is committed to providing a professional experience for our clients. When he is not working he enjoys traveling, hiking, and spending time with family and friends.